Every meal is dictated by our preferences and experiences in the kitchen, and we hope, as a result, that our food can provide a starting point from which to cook more and be creative. Whether you’re following a recipe to the letter or putting your own twist on our instructions, we’ve included our methods for adding flavor to any dish. Adding enough salt to your food will make it taste better, period. If your food tastes not quite right and you cannot figure out why, try adding more salt. Each type has a different intensity, flavor, and texture, so it is always best to trust your own senses rather than the exact measurement a recipe calls for. When you are finished cooking, always taste for seasoning. Food needs less salt when it’s hot than when it’s cold—if you are serving a dish room temperature, make sure to taste it again once it cools. Also, some ingredients, notably olives, cheese, and canned beans tend to be salty. Make sure not to season too heavily at the beginning of the cooking process if you are adding any of these ingredients to the mix later on. 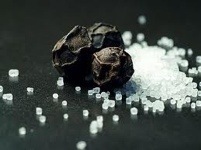 Pepper adds an extra bite to a dish–use freshly ground black peppercorns, not the powdered stuff. Adding wine—usually white, unless the dish won’t be made ugly by the color of the red—to whatever you’re sautéing or braising will add a deeper, more complex flavor. Let it reduce and grow slightly opaque before moving on with the cooking–this is deglazing. Don’t buy cooking wine—you can use a cheap bottle, but it should be one you would drink. If you’re using the bottle in increments, it’s nice to have one with a screw top. 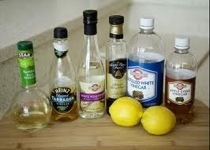 Splashing a bit of vinegar or lemon juice at the end of the cooking process adds clarity to a dish’s flavor. Be careful of the fumes when you first add vinegar, and also note that lemon juice will muddy the color of any fresh green herbs—for example, if making Basic Basil Pesto the night before, make sure to save the lemon until right before you serve it. 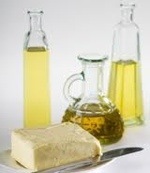 Normally, the fat we cook with is olive oil. It can be heated to a very high temperature without burning, unlike butter. To increase richness, we’ll add a pat of butter towards the end. Sautéing aromatics creates a great deal of flavor since the cooking and caramelizing extract their sugars. Garlic and onion provide enough flavor for pasta sauces and sautéed greens. 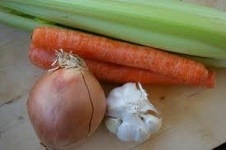 For more flair, depth, and sweetness, especially when making stews or tomato-based dishes, add diced carrots and celery, then sauté them slowly with the onion. A few well-placed jars on the spice rack can save you lots of fresh herb angst, if you hate watching extra fresh herbs go limp in the fridge. Oregano adds authenticity to tomato sauces. Thyme can increase the woody flavor of Parmesan-Herb Stuffing. 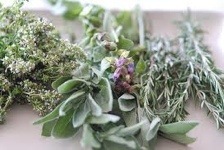 On the other hand, fresh herbs taste so good on their own, it’s no wonder they make the dishes they’re in transcendent, creating brightness in a dish.There are many ways to use up fresh herbs or preserve them if you’ve bought a bunch for a particular recipe. To make fresh herbs last longer on their own in the fridge, make sure they are completely dry—wrap them in a paper or cloth towel just in case—and store them in an airtight plastic bag. If the herbs still have their roost, you can stand them upright in a glass filled with water (much like flowers), and keep it in the fridge or on a countertop.